What a beautiful fall day it turned out to be today! One of the highlights of my day was spending a little time in our new and beautiful rose garden on campus with Jeanne Hartling. Jeanne is a recent retiree from FVTC, a person I’ve known and worked with for almost three decades. Sadly, Jeanne lost her husband Bill earlier this year. He was a long-time and highly respected educator with the Appleton Area School District and a master rosarian. Thanks to the generosity of Jeanne and her family, they honored Bill’s memory and skill with roses by donating hundreds of these lovely plants to the College and its Horticulture Technician Program students. Our students did just a masterful job, themselves, in planning and creating this outstanding new garden that faces Bluemound Drive. Jeanne and I had a chance to reflect a little today, enjoy the garden, and take in the warm sunshine. She met me there as I had a “thank you” gift I wanted to give her. This story, including a nice photo of Jeanne sitting in the rose garden, was featured recently in the Post-Crescent and I had the article framed for her. 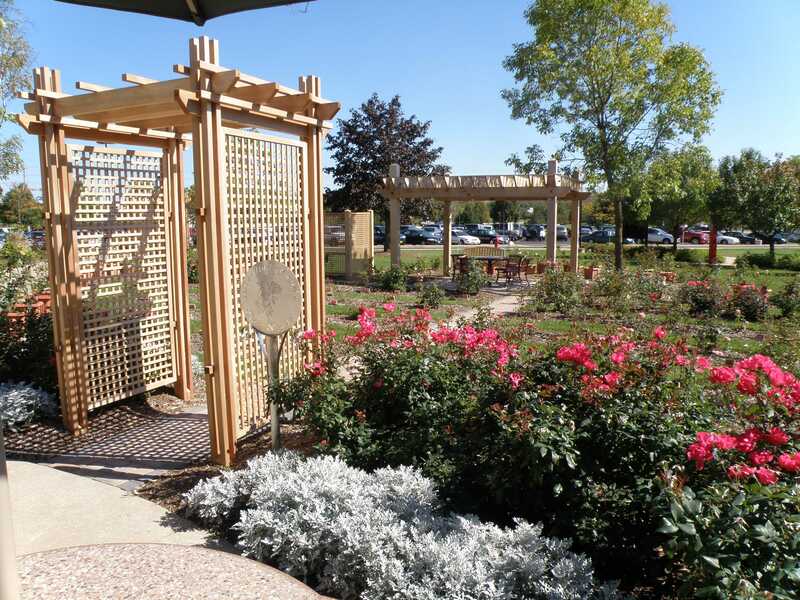 It was just nice to take a little time to smell the roses today…in the Hartling Family Rose Garden. Last week I had a chance to chat with one of our Mechanical Design faculty members, Egide Nimubona. You may have seen the recent Post-Crescent article featuring Egide: Fox Valley Technical College instructor starts education fund for Burundi. I didn’t know the full extent of Egide’s personal story until reading that article myself, and what a story it is! From walking up to five hours a day barefoot among the many dangers of the African terrain to go to school, to fleeing for his life in his country of origin, to becoming a U.S. citizen, I thought that was story enough. But it didn’t end there; his story got even better. In talking with Egide, it was clear how very grateful he is for the opportunities he has been afforded in this country, say nothing of the sense of safety and security that he and his family feels here in northeast Wisconsin. These are such fundamental privileges to most of us that we don’t even think about them. Even attending school is a fundamental privilege for children in this country, but not in his homeland of Burundi. As one of our newest Americans, Egide is committed to giving back and helping other children get some level of education, helping to make some dent in the vicious cycle of poverty. It’s also a wonderful tribute to his father who clearly knew that an education was the only way his seven children would survive. Last week a colleague and I had the opportunity to host the meeting of the Sales and Marketing Professionals of Northeast Wisconsin on campus and do a presentation for them. We were asked to focus on the impacts of the recession on our organization and how we have responded. To address this, we talked about the market shifts we’ve experienced, the ways in which we’ve adapted, as well as various strategies used to communicate with a wide range of customers. What a great group of leaders from the region! It was clear that many members of this group were also in the throes of adjusting and constantly adapting to new market realities of all kinds. One company was looking at opportunities due to the recent closing of a competitor, an entrepreneur was needing to build a Web presence for her business, and another individual who had been down-sized recently was just launching his new business trying to get some traction in the marketplace. All kinds of changes and adaptations going on. And this was evident from just three short conversations with members of this group after the presentation. I was one of about 1,000 people who attended the annual Women’s Fund Luncheon Thursday at the Radisson Paper Valley Hotel in Appleton—mostly women and a few good men. It was the 10th anniversary of this luncheon sponsored by the Women’s Fund for the Fox Valley Region, Inc. This organization has accomplished so much over the last decade in support of their mission of “investing in women and girls through grants, advocacy, and education.” Some of our own students and programs have benefited from the generosity of the Women’s Fund over the years. Women of the Fox Valley Region are simply amazing. They show up in droves for this great annual event and bring with them incredible energy matched by such dedication to making our communities a vibrant place to live and work. It’s always a fun and inspirational event and I was so pleased to have some of our staff, trustees and guests of our Foundation there to represent Fox Valley Technical College. Earlier this week I presented a wonderful family from northern Wisconsin with a diploma in honor of their young son (and husband) who had recently lost his life to cancer. This young man was a student in our automotive technician program and was actively involved with the “Beat the Heat” student club. His passion was cars and he lived his short life pursuing his passion to the fullest. His parents recalled their first trip to Fox Valley Technical College when they were visiting potential colleges for him to attend. His mom indicated that the minute he stepped foot in our automotive lab, he just knew this was where he was going to school.